A traditional round wood pencil that is available in almost any color you desire custom imprinted. or # 2 1/2 graphite lead. A #2 graphite lead is the default lead if not specified on your order. Optional pre-sharpened pencils add $25.00 per thousand units or increments thereof. 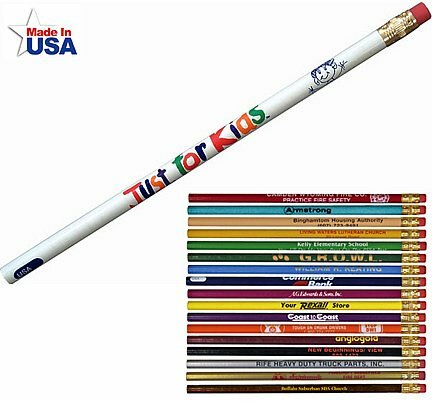 These pencils are bulk packaged in a carton standard. The price includes a one standard color imprint in an area 3/4" h x 4 1/2". color add $30.00 per thousand units or any increments thereof. This pencil has a maximum of a ten color imprint. The Pencils were exactly what I ordered! !